A few months after I moved to Raleigh in 2002, I found myself on the inner Beltline, heading from Glenwood toward Capital Boulevard. It was a dreary, rainy sort of day, with gray overcast skies, and I remember seeing a billboard for the Carolina Mudcats, a minor league baseball team out in Zebulon, about thirty miles east of Raleigh. Until that moment, it hadn’t occurred to me that Raleigh didn’t have a baseball team. There were the Durham Bulls, but that was in Durham. And Zebulon was definitely not in Raleigh. In the area, sure, but that’s not the same thing. The point was, if you lived in North Carolina’s capital, if you wanted to see high-level baseball, you had to travel either east or west. In time I would learn the reason why Raleigh had no baseball team to call its own. The Mudcats, when they relocated from to North Carolina from Georgia were intended to be based in Raleigh. Unfortunately, the rules governing minor league baseball give existing teams an exclusive territory of 35 miles from the stadium, and all of Raleigh fell within that distance from the Bulls’ stadium (seen in the classic film, Bull Durham). The Bulls ownership of the time said no to the Mudcats relocating to within their territory, even though the Bulls and the Mudcats were in different leagues and at different levels. The Mudcats’ owner took out a compass and a map, drew a circle of 35 miles radius centered on the Durham Bulls park (so the legend goes), and decided Zebulon would be the spot, falling as it did outside of the Bulls’ territorial circle. The Bulls’ intransigence would come back to bite them several years later when the team was upgraded to Class AAA; they needed a newer, larger, AAA-class stadium, but their plans for a stadium near RDU, the airport midway between Raleigh and Durham, fell within the Mudcats’ territory, and when they denied permission to encroach on their territory the Bulls were constrained in where they could go with a new stadium. The point of this piece of baseball business history is that for the Raleigh area to become home to a baseball team, an affiliated minor league team simply isn’t an option; there were — and are — too many stakeholders with an interest in Raleigh not having a minor league baseball team of its own. An independent league team of washed up major leaguers and washed out minor leaguers, like, say, the Atlantic League, not being bound by minor league territorial rules, was one possibility. The town of Holly Springs, just outside of Raleigh (and just to the south of where I worked in Cary) went in a different direction — in 2015, they fielded a collegiate summer league team, the Holly Springs Salamanders, in the Coastal Plain League, and Jason Zemcik offers a fan’s eye view of their arrival on the scene in his book, Leadoff Hit: Inside the Inaugural Season of the Holly Springs Salamanders. I’m not sure when or even how I became aware of the Salamanders’ existence. I suspect it was probably from reading Ballpark Digest, a website devoted to news about baseball fields at pretty much every level of the game, because I can recall reading about the team’s ballpark’s construction and thinking that they were trying to do something really impressive down in Holly Springs. My sister and her family live near Holly Springs, and I suggested a few times last summer that they take my niece to a baseball game at the new ballpark, but I don’t know that they ever did. If I still worked in Cary, which I haven’t in a decade, I’d certainly have taken in a few games in Holly Springs after work. There’s a small genre of baseball books focused on the college summer leagues — Jim Collins’ The Last Best League, about the 2002 Chatham A’s of the Cape Cod League; Austin Gisriel’s Safe at Home: A Season in the Valley, about the 2009 New Market Rebels of the Valley League (which I discussed here); and a few others that discretion prevents me from naming because they’re simply not good. These books generally follow a group of young men, right around 19 or 20, as they play baseball with wooden bats, sometimes for the first time, in an unfamiliar setting, usually a small town, where they refine their skills or discover their skills have taken them as far in the pursuit of their baseball dreams as they will ever go in front of crowds who are passionate about their town’s team and support them, from volunteering at the ballpark to hosting the players in their homes for the summer. I grew up with college summer ball — my first in-person baseball games were of the Harrisonburg Turks in Virginia’s Valley League — hence, my interest in the genre; reading Safe at Home helped me to contextualize my memories of Turks games, for instance. Zemcik’s Leadoff Hit takes a different approach to the genre. Largely eschewing the players and their stories, the book focuses instead on the organization trying to get baseball off the ground in Holly Springs and the community that embraced the team. Accounts of the baseball games played by the Salamanders are present, but they’re related as moments that are important in terms of organizational history (first game, first hit, first home run, etc.) or in terms of building interest and loyalty in a nascent fanbase. Otherwise, the book, which runs about fifteen thousand words, is about getting the team up and running behind the scenes, the challenges the management faced, their strategy at building the team, and the community of fans who supported the team. Some things in Leadoff Hit surprised me. Most notably, the attendance at Salamanders games, which drew 2,000 fans a night. I found that eye-popping; I don’t remember Turks games thirty years being heavily attended, and this year at the Baltimore Redbirds games I attended attendance hovered around 50. I was also surprised that they served beer; I don’t think Valley League teams did in the 80s nor that they do now, and the Redbirds certainly didn’t. The impression I took from Leadoff Hit is that the Salamanders, and possibly the Coastal Plain League as a whole, operates more like the Northwoods League than the Valley League, the Cape Cod League, the Cal Ripken League, creating a minor league-quality experience in the college baseball circuit, from the stadium’s size to its amenities to the on-field presentation and activities. In that sense, then, it seems that they succeeded in bringing a minor league baseball experience to the Raleigh area. There were a few areas I wished the book had addressed — How difficult was it for the team for find host families for non-Triangle players? How did the team settle on the name “Salamanders”? Did baseball scouts sit in the stands in Holly Springs? — and occasionally I wished for the team itself to have more of a “voice” in the unfolding narrative. Compared to other entries in the genre, you don’t meet the players in Leadoff Hit, you don’t know what they do in the downtime, you don’t learn how they feel about being Holly Springs’ first high-level baseball team, you don’t learn how they cope with adversity, from losing streaks to physical injuries. Backgrounding the Salamanders’ players lends Leadoff Hit a different feel; the narrative distance recreates the distnace 99% of baseball fans have with the team and players they follow. 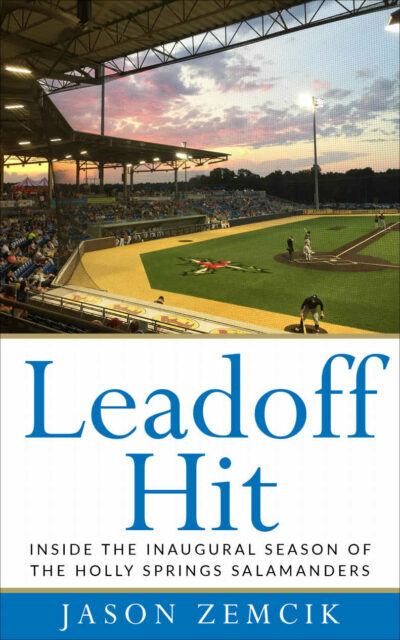 Leadoff Hit is a straightforward account of a town and its baseball team’s first season. Zemcik’s fandom and his love of baseball shines through, and even though the book doesn’t follow some obvious avenues, overall I found Leadoff Hit satisfying. The result is a very readable account of the Salamanders’ first season and one of the genre’s better examples.